Want to listen to Sound Radio Wales around the home, in the garage, a work or maybe in the car? Using a mini FM transmitter from Amazon you can send audio from your laptop, desktop computer or smartphone headphone port to your FM radio! Simply set the FM transmitter to an unused frequency (Example 108.00Mhz), plug it into your devices headphone port, set your FM Radio to the same frequency and listen to Sound Radio Wales on your radio. You can also use it to listen your favourite music on your smartphone and as a handsfree speaker while driving. The frequency travels only a few metres and most are chargeable by USB, so no need for batteries. 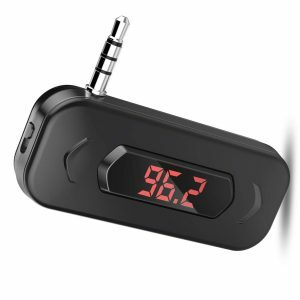 You can order NOW from Amazon and if you have a PRME account you will have next day delivery, visit the links below to purchase your mini FM transmitter now!